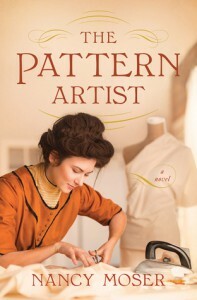 I received a copy of “The Pattern Artist” by Nancy Moser via Barbour Publishing and their partnership with NetGalley in exchange for my honest review. This is the first book I have read by Nancy Moser and I look forward to reading more. I really wanted to love this story as it contained so many of my favorite things to read about, history, fashion, some mystery/suspense, romance, rags to riches, plus an inspirational message, and for the most part I did enjoy this story, however, everything just seemed to happen way to fast. My first thought is that this wonderful story should have been a series or maybe at least another 100 pages. Annie progressing from maid to shopgirl, to pattern designer/artist and then to fashion designer all within just a few months was a bit overwhelming with everything else that also happened in her life. Nancy Moser’s attention to detail when it came to the historical aspect of this book was authentic and worked very well with the fictional part of the story. Her descriptions were so good that one could not only smell the bread in Tuttle’s bakery but taste it too, visualize the clothing in Macy’s, the actual drawings and dresses in Paris, and the making of a Butterick Pattern. I learned a lot reading this story and Nancy made it fun. The suspense/drama between Grasston, a footman, Annie, and her friends, Iris and Danny, had me on the edge of my seat, add the romance/adventures of Annie and Sean, a Butterick pattern salesman, and the pages just kept turning. One thing that truly amazed me was that Ms. Moser brings all of her characters to life so vividly that you feel you know each one of them personally. Overall Nancy Moser wrote a captivating story of historical people and events which blended effortlessly with the fictional characters and their adventures. I highly recommend this eloquent story of Annie’s adventures and her journey into womanhood.